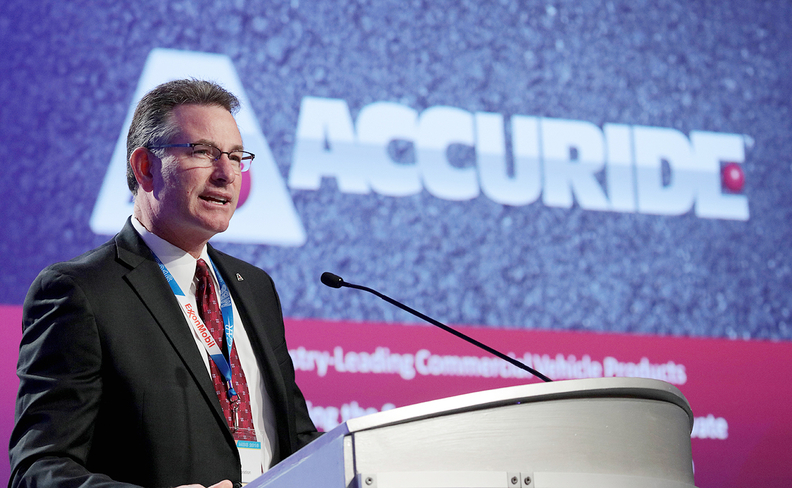 Rick Dauch: Acquisition allows Accuride to serve "global customers across a broad range of on-road and off-road applications." U.S. Automotive wheel and related parts supplier Accuride Corp. agreed to acquire German competitor Mefro Wheels GmbH in its second acquisition this quarter. The addition of the German steel-wheel maker gives Accuride access to both commercial and passenger vehicle markets, Accuride CEO Rick Dauch said in an email to Automotive News. Mefro supplies "nearly all of the leading brands" of automakers, said Accuride spokesman Timothy Weir. After years of losses and heavy debt loads, Accuride was acquired and recapitalized by a private equity firm in November. It is now seeking to grow globally. The Mefro acquisition "will enable us to better serve the needs of our global customers across a broad range of on- and off-highway applications," said Dauch, who took the reins of Accuride in 2011 after the company emerged from bankruptcy. Dauch previously served as vice president of worldwide manufacturing for American Axle and Manufacturing Inc., where his late father, Richard E. Dauch, was co-founder and longtime CEO. In its 2015 filings with the Securities and Exchange Commission, Accuride refers to Mefro Wheels as a primary competitor in the wheel market. "Combining our complementary product offerings, operations and customer relationships will enable us to serve as a dependable source of high-quality wheels and wheel-end components for our global customers across a broad range of on-road and off-road applications," Dauch told Automotive News in the email. Privately owned Mefro Wheels employs about 3,000 workers at three plants in Germany, two in Russia and one each in France, Turkey and China. The acquisition would join Mefro's workers with Accuride's 2,000 and spread the combined 5,000 employees over 15 plants in North America, Europe, Russia and the Asian-Pacific region. Accuride, of Evansville, Indiana,​ already has plants in the U.S., Canada, Mexico and Italy. Financial terms of the pending deal were not disclosed, but it will require antitrust approvals in several European jurisdictions, "which makes it difficult to estimate timing," Weir said. The deal is not subject to regulatory approval in the U.S.
Accuride was formed in 1986 to acquire the wheel and wheel-end division of Firestone Tire & Rubber Co. The company grew through acquisitions, but like many parts suppliers took a beating from slumping global demand during the Great Recession in 2008 and 2009. In 2009, the company filed for Chapter 11 bankruptcy and emerged in 2010 with a new capital structure. Accuride went public the following year when Dauch was appointed as CEO. New York City-based private equity firm Crestview Partners acquired Accuride in 2016 in a take-private deal valued at $124.5 million. Crestview declined to comment on the Mefro Wheels acquisition agreement. The pending deal with Mefro would be the second acquisition under Crestview's ownership, following a deal announced in April with wheel and parts supplier KIC, of Vancouver, Wash., which was finalized last month. Financial terms of the KIC acquisition weren't disclosed.